MAHAGAMI mainly focuses its training system on the Guru – Shishya Parampara wherein the knowledge is passed on from the guru (preceptor) to the shishya (adept) through a personalized and intense process. The shishya not just learns the art and the concepts related to it from the Guru, but also imbibes his vision for art in particular and life in general. The Teaching – Learning process, hence, becomes a life – long journey with many discoveries, rediscoveries and realization. Training at MAHAGAMI is a unique synthesis of the modern technological and educational aids and the intense value-based training system of the ancient Gurukuls. In contrast to the present scenario where pace has replaced endurance and harmony within the body, mind and soul, Gurukul training facilitates realization of the creative space within and its manifestation. Training comprises teaching based on Guru- shishya parampara in Kathak and Odissi dance forms and allied disciplines like vocal music, yoga, instruments, dance theory, etc. to supplement their understanding and widen their vision, many guest lectures, workshops, educational tours and their participation in dance festival as performers or observers are arranged. Though the main objective of the training at MAHAGAMI is to produce potential performers, dedicated teachers and researchers, the training pattern also caters to the uninitiated students and art aspirants of different levels. School / college education in one of the institutions managed by Mahatma Gandhi Mission can be coordinated for out-station shishyas pursuing formal school/college education and staying in the Gurukul campus. ARAMBHA (“the beginning”) is a six-month module that offers elementary training in the chosen dance form. 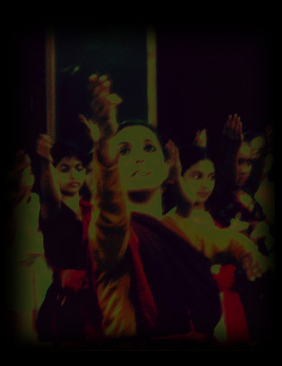 UDBHAV (“to evolve”), the second stage aims at learning and assimilating finer aspects of the chosen dance form. SAMARPAN (“earnest dedication”) module aims at refining the nuances of the dance and facilitating a better perception towards the aesthetic journey of arts. This is usually a full-day course with classes in yoga, music, theory, etc. Shishyas are encouraged to devote more time for individual ‘riyaz’ and introspection. It is this phase, where the shishyas though systematic and focused training eventually evolve as promising performers. Every year, SADHANA Gurukul Camp is organised with an aim to refine the sensitivity of the dance-seekers and to reinforce multi-disciplinary approach in the teaching methodology. Disciples follow a ‘Gurukul’ life-style starting their day with herbal tea and Yoga session followed by sessions of dance practice, music, instruments, taal, theoretical concepts, theatre, painting, sculpture, pottery, etc. The students also get opportunity to spend informal moments with visiting Gurus and artists and also with practitioners of rare art forms who share their artistic creations with the Sadhakas. ‘AKALAN’ the assessment system of MAHAGAMI is conducted every year which includes written and practical assessments, assessment of dissertations, case-studies or performance projects as assigned to the students or as individually undertaken by them and assessment of solo performances by senior students. Talented and deserving students are recommended for performances in many reputed festivals and for teaching assignments in educational and cultural organisations. Few disciples of Parwati Dutta have been recipients of scholarship schemes of Center for Cultural Resources, Delhi and Junior and Senior scholarship schemes of Culture Ministry, Govt of India. Some of them have performed solo Kathak / Odissi in prestigious festivals like Sangeet Natak Akademi Nritya Pratibha, Kathak Mahotsav (Kathak Kendra, Delhi), Guru Kelucharan Mohapatra Festival, Ellora Festival, Mardol Festival (Goa), etc. Few Senior disciples have also toured with their Guru Parwati Dutta through the Indian Council for Cultural Relations, Govt. of India and many other reputed International Organisations.